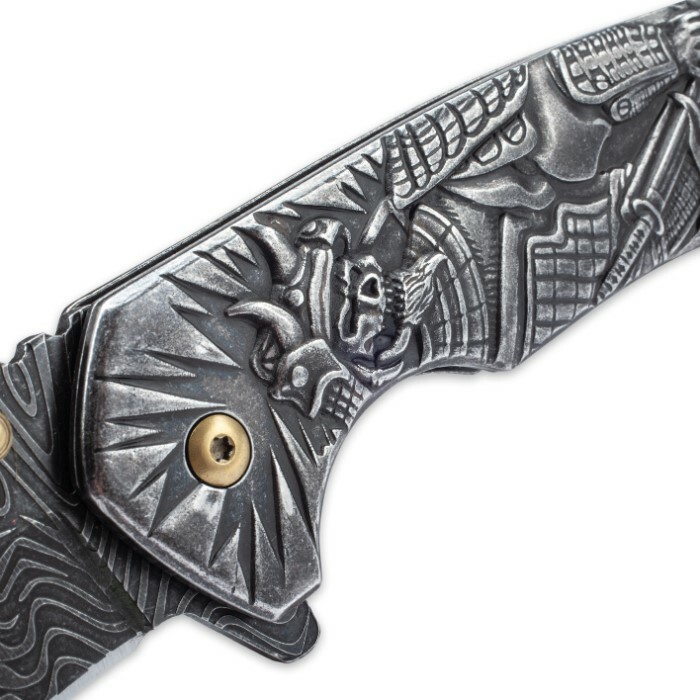 Do not let this striking, fully-functional pocket knife get away because it will go quickly! Just begging to be displayed in your collection, the Shadow Warrior Assisted Opening Pocket Knife is an exceptional piece of sculptured artwork. 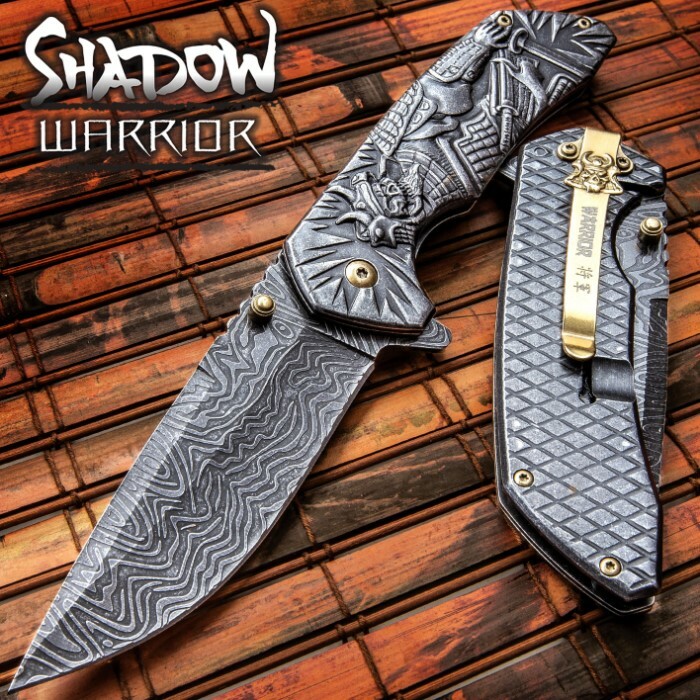 A shadowy Shogun warrior posed with his sword drawn for battle is intricately sculpted on the cast stainless steel handle and the 3 1/2” blade is crafted of DamascTech steel. The blade can be quickly accessed with the assisted opening mechanism via the thumbstud or blade spur. 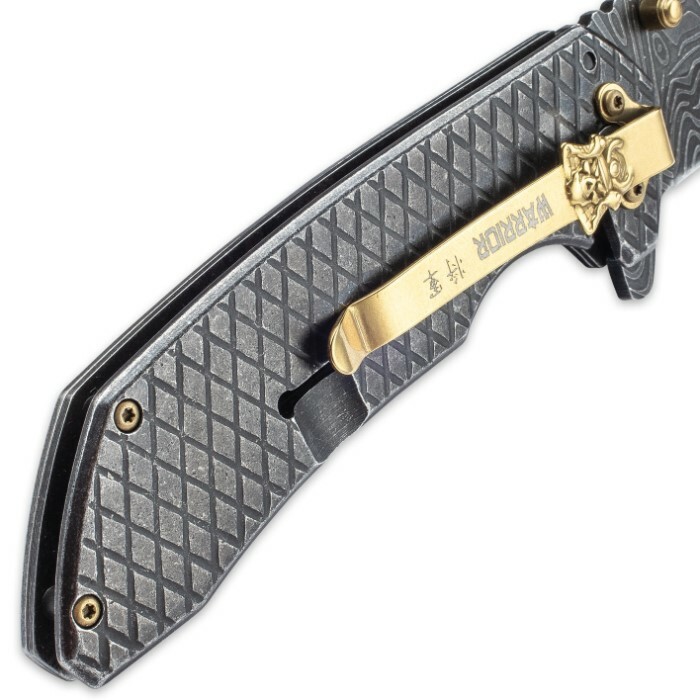 The pocket knife also features a brilliant gold-plated metal pocket clip with a menacing Samurai skull medallion. It is available in two other color schemes that are equally as impressive as this one. Collect them all! This knive looks awesome. It is very sturdy and well built, but it weighs a ton. I will most likely not be using this for an EDC. This knife does make a good display piece, so that is probably what I will use it for. The knife is well worth the money, and would make a great display item for anyone. I like the entire series of these knives. All of these Shadow Warrior Assisted Opening Pocket Knives are good looking,well built,priced right,and are"substantial" in your hand. I just got my latest SHTF box and this knife was in it. I have seen this on here before but just based on the pics I thought it was not that cool. But when I opened it up and started looking at it, I was immediately impressed with the weight, quality and the detail. It also is very sharp. I have usually had to sharpen the knives that come in my SHTF box but this one is very sharp right out of the box. The gold accents make it look beautiful as does the intricate detail on the blade itself. I highly suggest this as a purchase and my son thinks he may order one as he really likes it too but I won't give it up so he'll have to get his own.